MyBlogLog released a new feature today that is leveraging their recent “New with Me” Lifestreaming functionality. 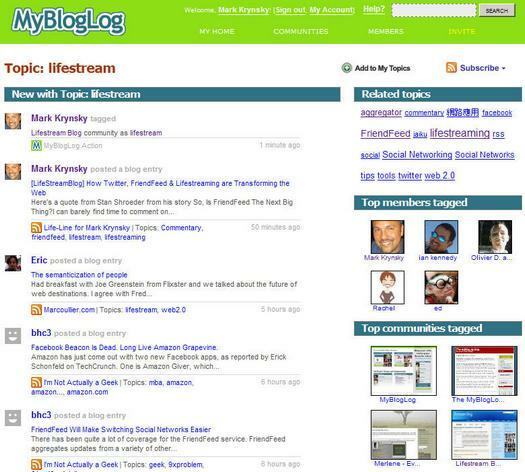 Upon the release of “New with Me”, MyBlogLog became an entrant in the Lifestreaming services group. So after laying the foundation, and having had time to import a ton of data, they’ve decdided to travel down a different direction with their new “Topics” collaborative filtering. I think this is a great new path they are taking to differentiate themselves from the Lifestreaming service forrest. So many of the services have a “me too” attitude competing on similar functionality and I think it’s great that they are thinking along new lines. MyBlogLog started out as a community for bloggers to join and discover each other. By taking the Lifestreaming data and using it for their new “Topics” functionality, they are now on a path to extend what makes them great. This seems to align with their mission to provide another way for bloggers to connect based on the content they generate. I think by focusing on this goal they are distinguishing themselves from other services. The MyBlogLog recent readers widget is arguably one of the coolest ones out there. You see it plastered on blogs everywhere. It’s great to see avatars for friends and new users who have visited your site. I love their cool new widget with “flyout” functionality. It gives a quick glimpse into the user who visited but it’s not enough. I’m hoping they decide to start displaying “Topic” tags for users in the widget. If they do that I think they kill two birds with one stone by giving the blog owner better information about the user & gain them more traction for this new feature by providing a link to the Topics page. Many innovative features will be spawned from existing and new services with the Lifestreaming data they are acquiring. I applaud MyBlogLog for paving a new path and I look forward to other services following their lead with some more innovative stuff.